Experience Jimi Hendrix like you never have before: A new John Vondracek-directed music video was unveiled on Friday, featuring a previously unreleased song from the late artist, titled “Lover Man.” The music video features archival footage of the legendary guitarist performing the song on his iconic “Flying V” guitar, cut between montages of home movies and photographs from Hendrix’s studio sessions. All of this is seen through a trippy, kaleidoscope-like filter. 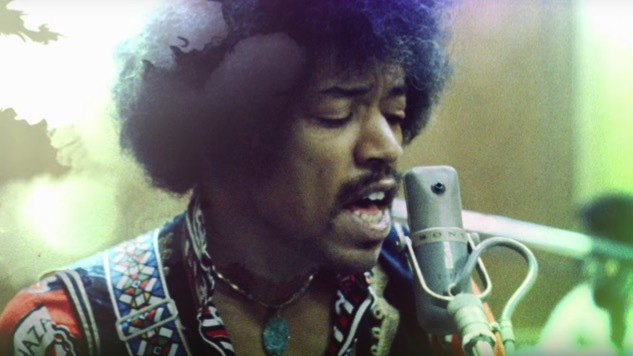 The psychedelic music video came along with the release of a new Hendrix album titled Both Sides of the Sky, first announced last year. This Eddie Kramer-produced album marks the end of a trilogy of posthumous Hendrix albums, following Valleys of Neptune in 2010 and People, Hell and Angels in 2013. The 10-track album celebrates one of the greatest figures in American rock ‘n’ roll, with special guest appearances by Stephen Stills, Johnny Winter and Lonnie Youngblood. To support the album, blues legend Buddy Guy and a backing band from the Experience Hendrix Tour are lining up to perform a song off the album on Jimmy Kimmel Live! on March 13. Experience Hendrix in his purest form with the music video to “Lover Man” below. Then, revisit Paste Cloud audio of Hendrix performing “Voodoo Child (Slight Return)” live circa 1970 further down. Both Sides of the Sky is out now—you can stream or purchase the album here.